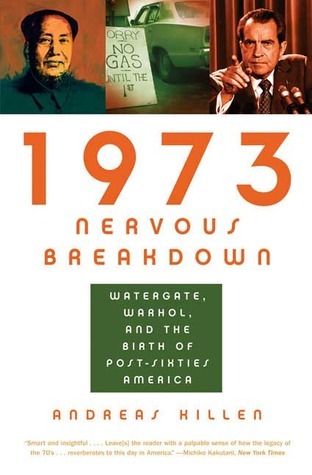 entreVIEW: What: Andreas Killen, 1973 Nervous Breakdown: Watergate, Warhol, and the Birth of Post-Sixties America (Bloomsbury, 2006). Why: A review of the remarkable year when everything changed. Just before the holiday weekend, the evening news ran a short story about the number of people expected to be traveling by car, despite a rise in the price of gas over the prior several weeks. This led me to reflect—as these things are wont to do—on a period in my life when you had to wait in long lines for gas, with no assurance that any would be left when you reached the pump. Yes, I’m talking about 1973, the year I got my driver’s license, just in time for the Arab oil embargo and the resulting gas shortages. It was also the year of these songs, in case you were wondering. With the benefit of hindsight, it seems that perhaps the greatest outcome of the resulting cultural reboot, arising from the loss of confidence in the government at the same time the economy stagnated, was a shift of faith to the private sector. With this shift came renewed and reinvigorated entrepreneurial activity, which has blossomed ever since.